There are some charities I will go the extra kilometre to support. Children at Risk (Ottawa) is one of them. They support children and families affected by Autism. Each year they host a celebrity pumpkin carving contest. The pumpkins are outstanding and the prize packs that come with them are amazing as well. This year I was at the Carlingwood Mall supporting this great event. My favourite pumpkin by far was Jason Spezza‘s he also the best prize pack, including 100 level Ottawa Senators tickets, signed pumpkin, t-shirt, 20th anniversary scarf and toque and collectable mug. The bidding was fast and furious and I lost in the end, to an aggressive Spezza fan. While chit chatted my my fellow Spezza fan, I realized he was a bit of a hockey afichiando and knew everything about Number 19. 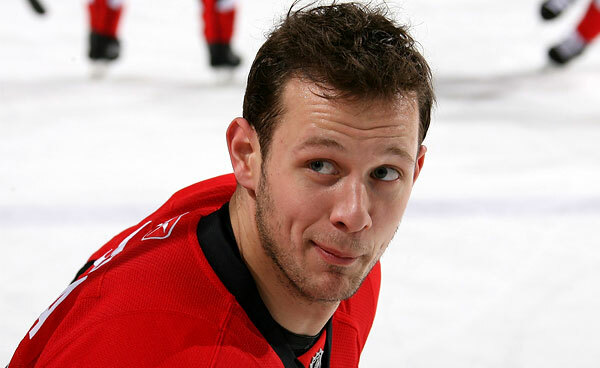 I was a little disappointed to hear that we might be losing Spezza to Toronto. **This is just a rumour, but is would be sad to see him go to the big Losing Leafs. I was lucky enough to snag the Ian Black (@blacksweather) of CBC Ottawa pumpkin. The kids picked it out because it came with a huge set of Schleich Farm Animals and Barn included. My husband, a huge CBC fan was impressed, he cannot wait to brag to his fellow engineers tomorrow about winning Ian Black’s pumpkin. It was a busy weekend for the kids and I. DH was at the cottage finishing the railings and getting everything ready for closing. It’s a little bit a sad time as we love spending time at the cottage together. But, in my own selfish way, I do loving having all three kids to myself for an entire weekend. ← Saunders Farm at its Finest – 20 years of Fall Fun!